Where did the year go? It seems like only yesterday that I was just dreaming of business plans for the 2013 year and event season, and here I am right smack in the middle of it. That also means I am half way through the year and it is time to reflect on how my dreams are shaping up. Just like the athletes I photograph, I track my numbers. Are my numbers better than last year? Are we photographing more races or more athletes? Is our processing time improving? I examined Focal Flame Photography's performance for the first half of 2013 and am pleased to say the answer to all three questions is "YES!" Not only are the number of events we cover growing but the number of athletes we photograph at each event is growing too. 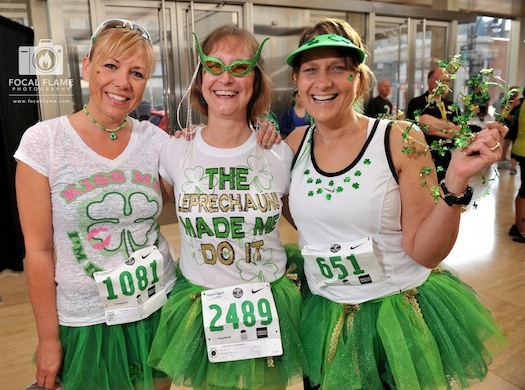 This year's Shamrock Shuffle, for example, grew from 3500 racers to 4700, nearly a 35% increase. When you think about what that means in terms of more people getting outside and embracing an active lifestyle, it’s fantastic. We have created more images —38,031 photos so far this year; that is only 5400 images short of the number we created in ALL of 2012. AND even though there are more athletes, more events, and more photos, we are editing and applying bib numbers faster than ever — averaging only 5.3 seconds per image. Why? Simply put, skill. Our editors are absolutely amazing – and amazingly efficient - at what they do. Probably the biggest boon to Focal Flame's increase in productivity is the people we have added to our roster of talent.We are "buying local," hiring talented photographers, editors, writers, and logistical event staff to extend our core philosophy and help us achieve our goals. Focal Flame Photography is not just Clint taking a photograph, it is Josh, and Katie, Austin, and Deb working with Robyn and me to do what we want to do, go where we want to go, and figure out how we are going to do it. In future posts we will tell the stories of our talented staff. What we want to do is tell your story with photographs. One unique way we accomplish that is by creating custom photo books that celebrate personal milestones, document professional achievements, or create team memories.Custom photo books combine words, wishes, and photographs that will keep your story alive for future generations. We are currently working on a heart-warming story of a youth soccer team that has been playing together since kindergarten, and is now headed to middle school. Creating such a permanent memory is deeply rewarding to me. Where do we want to go? My philosophy is to "Go left when everyone else is going right." That is why we have added a NEW video service to our Focal Flame gear bag. In the first 6 months of the year, we have produced some amazing videos for race organizers and commercial clients such the University of Wisconsin Master of Science in Biotechnology program. If a picture is worth 1000 words, just imagine what a 1-3 minute video can say. Stay tuned. And how do we want to do what we do? I love creating unique, meaningful images of great athletes running, swimming, biking, diving into mud holes, and crossing the finish line. Editing race photos one day, I looked at all these amazing athletes doing what they do and thought, "What good does it do to capture these moments of exhilaration, determination, and dedication if only a few people see them?" How could I make it possible for these athletes to share these moments with friends, family, and teammates more freely? The answer — FocalShare™ a service for race organizers that allows them to give complimentary digital photographs to all of their athletes. We have completed a number of FocalShare events this season and the response has been extremely positive. Athletes love the free digital photos and share them with friends and family, race organizers love the buzz that sharing creates, and we just love the smiles all around. If you are not sure what FocalShare™ is, watch for a future post that will describe this program in more detail. In reflecting on the first six months of the year, I see progress. We are photographing more events, providing photographs faster than ever, telling your stories in new ways, and delivering greater customer service and satisfaction to our athletes, event organizers, portrait, custom sport, commercial, and video clients, all while giving back to the community. Thank you for the part you play in making it all possible. What are your highlights from the first half of 2013? Share them with the Focal Flame community on Facebook,Google+, or on Twitter!